Are you ready to bring your Chicago home into the future? Would you like the ability to control your home heating and cooling system with your smart phone? Are you afraid that you don’t have the technical savvy to do it yourself? Well, if you answered yes to any of these questions, the Indoor Air Technology experts at Polar Heating and Air Conditioning have you covered. Whether you are looking for a WiFi thermostat that provides basic function of your furnace, air conditioner, or boiler, or you want something that can offer control of of other systems in your home, we can totally help. At Polar Heating, we have the experience and know how to bring your home into the 21st Century. Which WiFi Thermostat is Right for Your Home? Depending on your home and your individual needs, you must choose a smart thermostat that is right for your home, and is comfortable for you to use. At Polar Heating and Air Conditioning We offer the installation of WiFi Thermostats from AprilAire, the leader in Indoor Air Technology. 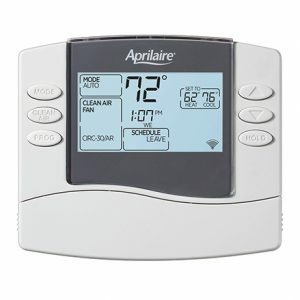 If you are looking for a simple to operate and efficient wifi thermostat, the Aprilaire model 8476W is the perfect option for your Chicago home. Aprilaire offers applications that work with both IOS and Android so you can program your thermostat from your smart phone, or any internet connected device. If you are ready to bring your home up to date and take control of your home heating and cooling, contact the experts at Polar Heating and Air Conditioning today. Our technicians can install your new wifi thermostat today!